If you want to paint a seascape with soaring blue skies and rippling blue water, you might go to the art supply store and stand in awe at the sheer range of blues available with different shades, tints, and variations in hue. 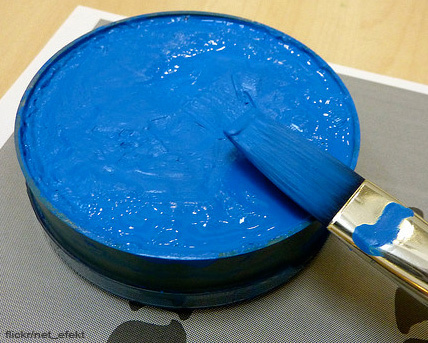 For instance, a major paint manufacturer offers at least 15 different types of blue, from Cerulean Blue on the lighter end of the spectrum to Indigo Blue on the darker end. The more you work with your paints, the more you’ll intuitively recognize which tube of blue to choose when you need to paint blue eyes, a bluebird or a deep blue sea. Although the distinct characteristics of each blue might be familiar to you, do you know where the name for each particular color comes from? As we discussed in a previous article on the origins of color names for artist pigments, many paint colors derive their names from what they are made of: for instance, Phthalo Blue is named for the synthetic pigment Phthalocyanine, and Cobalt Blue is named for the lustrous metal cobalt, etc. Anthraquinone Blue – “Anthraquinone” is an organic compound that forms the basis for many dyes. Cerulean Blue – “Cerulean” has its roots in the Latin word caelum which means heaven or sky. Indigo – “Indigo” is named for the Indigofera genus, many plants of which are used as a dye. Navy blue – The color “Navy blue” is named for the dark blue uniforms worn by officers in the British Royal Navy and was first used as a color name in 1840. Primary Cyan – “Cyan” comes from the Greek word kýanos, which means dark blue substance. Ultramarine blue – “Ultramarine” derives from the Latin word ultramarines which means beyond the sea. FREE SegPlay® Art Painting Evaluation for 10 days, Enjoy us, so easy, fun and what a brain teaser with no mess! This entry was posted in 3-d sidewalk art, Art, Brief Definition of Art History, Cerulean Blue, China and India, Christmas, Claude Monet, deep blue sea, different shades, Happy New Year, Impressionist painting, Kids Christmas Art, Mona Lisa, Monet, Mother's Day, Mother's Day Gift, Online Paint by Number, paint a seascape, paint blue eyes, Paint by Number kits, paint manufacturer, Patterns, pavement art, Pop Art, Puzzle, rippling blue water, sheer range of blues, Sidewalk art, Snow, Snow patterns, tube, Vincent Van Gogh, What is the meaning of Christmas and tagged Art, Blue, Cobalt Blue, Color by Number, color by number online, craft, easy, Indiofera, masterpiece, online color by number, online paint, Paint, painting, pigment, Royal Navy, Segmation, Ultramarine blue on December 21, 2010 by segmation.